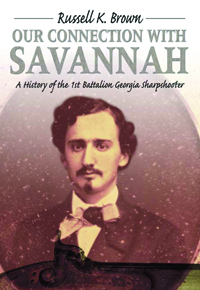 From the outset, the 1st Battalion Georgia Sharpshooters had problems. Much of the trouble lay in the organization of Civil War regiments and companies. Most companies in the early years of the war were made up of men from the same town or county. The concept of the sharpshooters was alien to this home-town tradition. Men were asked to leave the comfortable companionship of their neighbors and friends and go into a unit with people they had never met before. Despite its uncertain beginning, the battalion was molded into a fine unit by the skill and energy of its officers and noncommissioned officers. The sharpshooters early won the praise of higher-level commanders and inspecting officers. However, as the war dragged on, the battalion was reduced in numbers, morale, and efficiency. Notwithstanding its poor performance in the last months of its life, the unit has a high reputation that was well deserved. A Civil War veteran and historian called the sharpshooters "one of the best-drilled and most-efficient battalions in the service." This book objectively examines the organization, leadership, and performance of the sharpshooters, follows their wartime experiences, and devotes considerable attention to the individual soldiers. If the story of the 1st Battalion Georgia Sharpshooters has not been a well known story, it is now.